For 60 years, Siplast has been designing, manufacturing and marketing solutions in the fields of waterproofing roofs, roof terraces, green roof terraces (TTV), structures, but also foundations, roofing (shingles) , under-roofing (under-roofing and radiating barriers) and soundproofing. 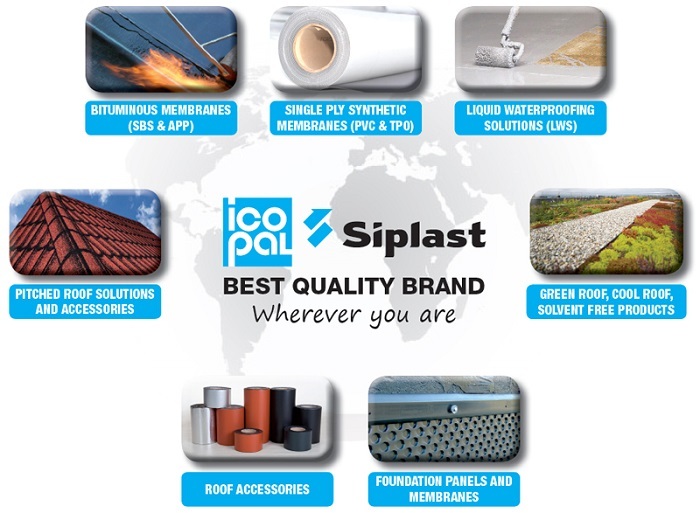 Siplast is a leading producer of waterproofing roofing membranes with manufacturing plants located in France and sales offices and subsidiaries in Italy, Spain, Algeria and Japan. The company counts numerous achievements and innovations in the field of bitumen roofing with products suitable from foundation waterproofing up to roof waterproofing. Siplast is the first manufacturer of SBS membranes roofing in the world for a series of applications in flat roofing and civil works. Siplast offers a range of sbs membranes and pvc roofing products for building waterproofing: single ply, underlayer and top-layer bitumen membranes as well as synthetic pvc membranes for flat roofing on various types of substrates. The liquid range completes the waterproofing products with bitumen primer, sealent and adhesive. Sustainable roofing solutions are a key priority for Siplast who has developped non toxic products and systems for green roof waterproofing and reflective roofs that give aesthetic and environmental benefits. Siplast produces a large range of products for pitched roofing and timber frames: under-roofing synthetic breathable membranes, bituminous membranes, bitumen shingles available in various shapes and colours and ventilation accessories. Siplast waterproofing technology is also present within civil engineering applications such as hydraulic works solutions (pounds, canal lining, waste water management), mining and environmental protection solutions (waste containment, tailing and leachate containment), road and railways bridge-decks, tanking and underground structures, drainage. Siplast supplies top quality products and achieves success by developing industry-leading technology thanks to a high commitment in R&D. And it is moving on steadily as part of the Icopal Group.